I have been neglectful of late in posting my Addicted to the Past feature. As many of you know, I'm in college and this semester has been quite a challenge so far (I'm on spring break this week...yay!). However, both of my classes are very suited to Addicted to the Past and my historical slant on this blog. I am taking African American history and art history and, while both are interesting, I have to admit that I am happily immersed in art history. So I've decided to focus this feature on art history for the next several posts. I hope you enjoy it! 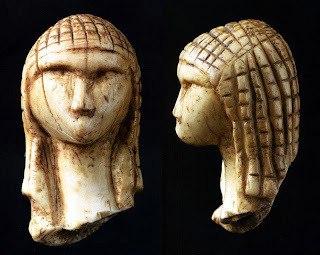 Discovered in the Grotte du Pape in Brassempuoy, France, a tiny ivory head dated to circa 30,000 BCE. This is one of the many predominantly female figures discovered from the Upper Paleolithic period. While it is clearly an abstract representation of a female head, I love the imagery of the grace of the female form in the depiction of the long, graceful neck and the patterned hair or headdress. Discovered in Chauvet Cave, Vallon-Pont-d'Arc, Ardeche Gorge, France dated to circa 30,000-28,000 BCE. The medium is paint on limestone. There has been much speculation as to the significance of these paintings ranging from ritualistic reasons to symbolic meanings for the luck of the hunt. Recent findings have determined that most of the animals depicted were not a part of the paleolithic diet. Many scholars now believe that, due to the inaccessible nature of the paintings' locations, the paintings were created solely for the purpose of enjoyment in the act of their creation. Much the same reason as people create art today...for the pure enjoyment of the act. 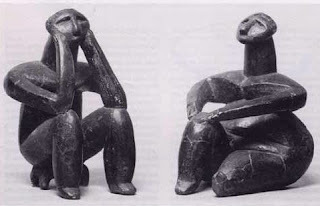 Ceramic figures discovered in Cernavoda, Romania dated to circa 3500 BCE. Their meaning is unknown, but since they were found in a grave, they are thought to have a symbolic meaning. The figures are posed in a very true to life fashion. Perhaps for the dead individual they were meant to depict a continuation of a normal existence in the afterlife. I think they are beautiful and the male statue reminds me of that famous statue, The Thinker by Rodin. 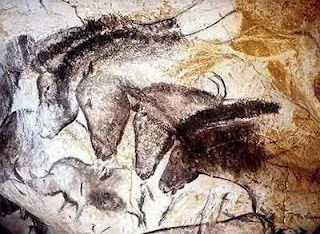 So, what do you think about prehistoric art? Was it created for symbolic or ritualistic reasons or purely for personal enjoyment? *Reference used was Art History: Volume I: Third Edition by Marilyn Stokstad. Wonderful post. I'm really enjoying these posts, I learn something new every time I read one. And To answer your question I think it's really all of the above. Every art piece I'm sure has inspiration behind it, as well as enjoyment. Who can really say? I think it depends--the cave paintings were probably a record of some sort vision quest, but the figurines might just have been something someone carved for pleasure. Or maybe every object has a significance.